1. 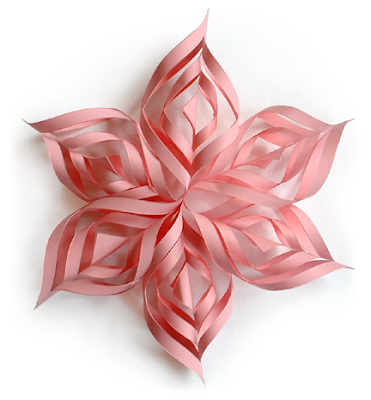 Download my large snowflake template or small snowflake template. Print enough pages so you'll have 6 squares (1 or 2 sheets, depending on which template you chose). Cut along the inner lines with an X-acto knife and then cut out the squares. 3. Moving outward from the center, bend the next pair of flaps around in the opposite direction until they meet. Overlap ends and secure with double-stick tape or glue. 4. Repeat with the next pair of flaps, bending them in the opposite direction. Do the same for each concentric pair of flaps, alternating directions each time and taping ends together. Continue on to the remaining 5 squares, making the snowflake parts the same way you did the first one. 5. Tape all 6 points together to form a snowflake. Love the orangey color; it sort of shimmers. I may try one of these. that is so cool. i think i'll try it. thank you thank you thank you! i've been sooo wanting to know how to make these! now i can!! u rock! i've also linked u up by the way! This is so gorgeous. Wish I had found it before Chrissy - oh well there is always next year. Oh, these are lovely! I'll have to make some for wintry valentine's decor. ok i've got mine all cut out and xacto'd - do i tape each little curl? like do the innermost flaps, tape, then the next set, tape? Yep! The "square' part in the middle you just curl a bit and don't tape because the corners don't reach. Working from the center out, take the next pair of flaps and tape them together. Then grab the next pair, bend them to the opposite side, and tape. And so on, alternating which side you bend to. This is so pretty. I am making one right now using a simlar shade of salmon paper. Thanks for sharing this craft. These are really great I love making things and these are so pretty, I love the color. trying it right now! so pretty, thanks for sharing! 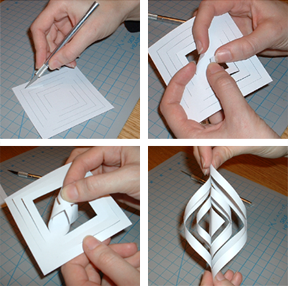 You can also make these by just folding a square piece of paper in half twice to make a triangle. Then make 5 cuts up the paper on the folded edge (the edge that doesn't open at all) towards the opposite side. I made a few of the individual "arms" and hung them in my window - they're pretty enough just like that. I didn't use an exacto knife. I folded the paper into half to make a triangle, then folded the triangle so that I could make the cuts identical on each side. I made one with just three cuts on each side and then another with six cuts on each side. The second one turned out much prettier. these are very pretty and i've made them for the office. i do have one quick tip... you don't have to use an exacto knife. instead just use scissors. much easier!!! Thank you for the inspiration!! this is so beautiful and easy. thanks for sharing. 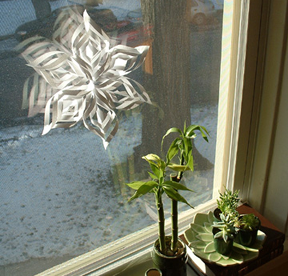 I love these snowflakes and was planning to make them for Christmas, 2010. However, they keep coming apart on me! what type of adhesive did you use? I have tried ZOTS brand adhesive dots and also Duck brand tape roller. Both have come apart. Please help...anyone? I use a stapler for attaching them all together. For making each part of the snowflake, I used a really old sticky glue stick, so I can't help you there! Just make sure to let each part dry before you put them together as snowflakes and hang them. I use regular double-sided tape. Scotch or something. I just tear off tiny little pieces. So far they've lasted a couple years. thanks for your responses. I think I may have figured out the problem, though...i was using a heavier cardstock rather than a lighter weight paper. I think it may be too heavy and that is why my points would not stay together. I am going to try again with a lighter weight paper and see what happens! Ah! That's it. I just used regular computer paper. I came out I did spectacularly! thanks for the info, congratulations on the blog ..
although this is a small blog, helped me to give me as I am an artist, is a joke, I was horrible the flower! my son gave me this pink and I did not know how he managed to do, now I realize that everything he does them out of these blogs! I made one and loved how easy it is to make. I will use white glitter paper and hang them from the ceiling for Christmas. Was feeling crafty and searched Google - sent me to you site! Thank you for the easy and cute snowflake! Since my printer is broken I just cut out the pattern freehand. Also used gluestick and staples to assemble. Still came out nice! I made two of these last night. One with cheap printer paper, and the other with a heavier orange card stock; My tree is creamsicle inspired this year. Until you get the hang of folding and holding these, DO NOT use card stock, it's more difficult to curl the edges and glue them. I used a glue stick (like in elementary school) and these came together in a snap. I love this! It's so easy and beautiful. My son and significant other have not been able to find a tree topper that they 1) both like and 2) that will stay on the top of the tree. I'm going to make one to match the color scheme of the tree as an early gift. Thank you for sharing! Will try making for the nursing home next year! Love your tutorial, however, The link for the template doesn't work. Is it possible to give the dimensions of the squares? Thanks! The link works for me. Maybe try again? been looking for this for weeks thank you so much! love them! My Husband & I made the snow flakes to decorate our enclosed front porch. We also made "icicles" with one square of the large, small, & extra small (the small template printed at 75%) templates. Thank you for inspiring creativity! it is good in christmas time.. I tried to make them and they are actually pretty easy. I love the ease of this project! I had some scrap booking paper that was white pearl on one side and purple glitter prism on the other and it made a gorgeous "sun catcher" for my windows. My grandkids loved making some to give to their mommies for Christmas. It's so easy my 4 yr old could do it himself! Thanks for sharing! I'd love to see what other projects you have. These are so cool! Do you know if Target sells double sided tape? Thanks. Also, I really love your blog. I have a blog too. It's called "Thenameisjulia.com"
I bet they do! Have fun, Julia!